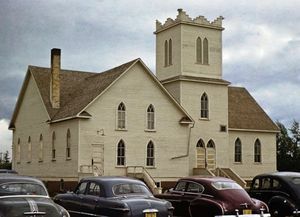 Hepburn Mennonite Brethren Church held its first Sunday morning service on 21 August 1910 and formally organized on 23 October of the same year. The first sanctuary was dedicated on 9 October 1910, with subsequent building programs in 1917 and 1967. Peter J. Friesen is considered the founding leader of the group. The congregation originated through immigration from Nebraska. There were 78 charter members in 1910. The church housed Bethany Bible Institute when it was first founded in 1927. A church building was erected in 1910 and enlarged in 1917. A new church was built in 1966. The Hepburn MB Church frequently obtained ministerial help from Bethany Bible School teachers. Hepburn MB Church grew to be the largest MB congregation in Saskatchewan and held that distinction for many years. Canadian Mennonite (4 April 1967): 1. Golden Jubilee of the Mennonite Brethren Church of Hepburn, Saskatchewan, Canada: 1910-1960. 1960, 30 pp. Hepburn Mennonite Brethren Church 100th Anniversary: 1910-2010. Hepburn, SK: The Church, 2010. Mennonite Brethren Herald (27 May 1988): 70; (May 2011): 32. Toews, John A. A History of the Mennonite Brethren Church: Pilgrims and Pioneers. Fresno, CA, 1975. Available in full electronic text at: https://archive.org/details/AHistoryOfTheMennoniteBrethrenChurch. Hepburn Mennonite Brethren Church Archives collection at Centre for Mennonite Brethren Studies. Address: Box 237, Hepburn, SK S0K 1Z0; located at 221 2nd Avenue South, Hepburn, SK. Toews, P. R. and Marlene Epp. "Hepburn Mennonite Brethren Church (Hepburn, Saskatchewan, Canada)." Global Anabaptist Mennonite Encyclopedia Online. March 2012. Web. 19 Apr 2019. http://gameo.org/index.php?title=Hepburn_Mennonite_Brethren_Church_(Hepburn,_Saskatchewan,_Canada)&oldid=163444. Toews, P. R. and Marlene Epp. (March 2012). Hepburn Mennonite Brethren Church (Hepburn, Saskatchewan, Canada). Global Anabaptist Mennonite Encyclopedia Online. Retrieved 19 April 2019, from http://gameo.org/index.php?title=Hepburn_Mennonite_Brethren_Church_(Hepburn,_Saskatchewan,_Canada)&oldid=163444. This page was last modified on 9 March 2019, at 03:23.